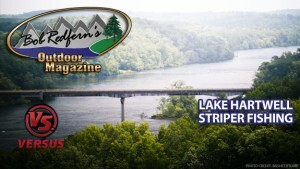 This week Bob heads to the upstate of South Carolina for an early morning striper bite. Lake Hartwell is one of the best kept fishing secrets in the South East, and Bob’s guide Rick Owen will put them right in the mix of some big Hybrids and Stripers. Don’t miss this show and see how Bob handles these big fish on light tackle from Abu Garcia! Your favorite outdoor cooking segment is back, and John Ondo from Lana Restaurant in Charleston, SC is cooking up Grouper on Vegetables. Don’t miss it! This entry was posted in Episode on 07/15/2010 by BROM.